* The age listed above is the actual age on 15th September 2013. *WKF and WSKF Rules for competition and referee are applied to this World Championships. *All competitors are required to bring their own blue and red belts. 1) When one competitor scores more than 8 points in advance. 2) When one competitor’s score is higher than the other at the end of competition time. All competitors are required to have entry(ID) and weight check. All Kumite competitors are required to bring their own protective equipments listed below. 1)WKF or WSKF approved mitts, one contestant wearing red and the other wearing blue. 6) Groin Guards are not mandatory, but if worn, it must be WKF or WSKF approved type. *All protective equipment must be WKF or WSKF homologated. The winner is decided by a majority of five (5) Judges with red or blue flags. All competitors are required to have an entry(ID) check. In the consolation match, competitors also must not perform the same KATA already performed in the same competition. In the final round of team KATA competitions, competitors must perform Bunkai-Kumite within six(6) minutes, after performing JIYU KATA. *Doping is prohibited. Doping test will be conducted at random. All referees consist of the official referees of WSKF. *The age as listed above is the actual age on 15th September 2013. *No limitation of the number of competitors. 1) When one competitor scores more than 6 points in advance. All Kumite competitors are required to bring along their own protective equipments listed below. *It is not required for competitors wearing full face mask. 6)WKF or WSKF approved face mask ( 6 to 15 years old competitors only). 7)Groin Guards are not mandatory, but if worn, it must be WKF or WSKF approved type. *(1) After quarterfinal round, succession of same KATA is not allowed but performing two (2) KATA one after another is allowed. *(2) Competitors cannot perform the same KATA already performed in the same competition. The Organizer has the sole and absolute discretion to interpret, alter and amend any of the rules and regulations and to implement additional rules and regulations at any time it considers necessary for the orderly running of the Championships and associated events; and determine all matters arising out of the Championships and associated events. The decision of the Organizer in consultation with WSKF Management Committee will be final. Firstly, please send us " Pre Planning Questionnaire " by e-mail no later than 30 April 2013. Secondly, please send us " Official Entry Form(Form 1~6)" by e-mail no later than 30 June 2013. After we accept your entry, we will send you a confirmation and invoice by e-mail. Then please make payment by bank transfer, no later than 31 August 2013. We can arrange the following accommodation for this Championships. If you wish to make a reservation, please fill in "Arrangement Request Form (Form 4)" and send us by e-mail with your entry. The number of rooms are limited, so please make reservation as soon as possible. In case of the large exchange rate fluctuation between Japanese Yen and US dollar, accommodation fee may change. Thank you for your understanding. *This accommodation is like a youth hostel. No room keeping, no hotel service, no room for couple. It’s takes about 20 minutes to National Olympics Memorial Youth Center. There are many restaurants and shops around the hotel. It’s takes about 30 minutes to National Olympics Memorial Youth Center. All persons who wants to take our international examination have to apply by our official form before 31st July. (Submit the Thesis no later than 30th June, if you want to take examination of Shogo qualification.) We never accept any application after the final deadline. We will inform the details later. Some countries are required a visa to enter Japan. As it usually takes one or two month to acquire a visa, please contact the Japanese Embassy in your country as soon as possible. They will give you the detailed instructions such as how to apply for Visa in your country and necessary documents to submit. If you need invitation letter or other assistance from us, we will do it as soon as possible. All competitors including Junior and Veteran Open Tournament have to have an ID checking and the process will be as follows. At the time of ID checking, all competitors have to bring their own original passport and ID card. We take a photo copy of your passport (the page with your photo). We check the face and age by your passport, and affix a seal to your ID card. We laminate your ID card with a photo copy of your passport. * The place for ID checking is the same place with weigh-in checking. * In case of reissue of the ID card, you have to have an ID checking again. And we ask for US$50 to reissue a new ID card. * Without ID checking, competitors cannot enter in any competition. On 14th September, we plan to have a special Tokyo tour and dinner for representatives of each country. And for other participants, we also plan to have some special programs to enjoy Karate or Japanese culture. We will inform the details later. All participants including supporters are cordially invited to join the SAYONARA (Farewell) Party on 16th September. (It is free for all participants) Please join us and deepen friendship with all Shito-ryu family in the world. 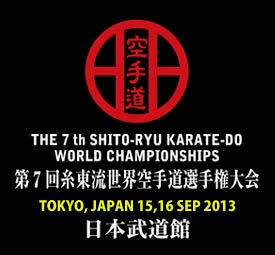 Copyright(C) 2013 World Shito-ryu Karate-do Federation.